Fans of the action-comedy-mystery anime series Bungou Stray Dogs should rejoice as the franchise is getting a third season according to the announcement made during the screening event for Bungou Stray Dogs: Dead Apple anime film on Saturday - July 21, 2018 at the Marunouchi Piccadilly theater in Tokyo. 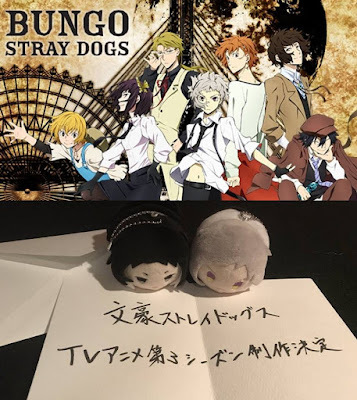 Although, there's no other information for the upcoming Bungou Stray Dogs Season 3 anime, fans can anticipate another round of exciting adventure filled with fun, humor, mystery, and solid fight scenes as the anime let us delve deeper on the world adapted from Kafka Asagiri and Harukawa35's supernatural action manga of the same name. Further details about the anime shall be posted here at Yu Alexius. Thus, don't forget to bookmark this site and check for latest updates about Bungou Stray Dogs in the coming days as we share information about the anime's release date, new premise and characters.